Hydrochloric acid is naturally secreted in your stomach to digest the foods you eat so they can be absorbed into your bloodstream. Many people have a deficiency of this acid, which can lead to other deficiencies. People over the age of 60 and those who are experiencing chronic stress tend to have a deficiency of hydrochloric acid, characterized by indigestion and nutritional deficiencies. Fortunately, there are natural ways to increase the hydrochloric acid in your stomach. See your doctor before attempting to treat low levels of hydrochloric acid by yourself. Take the supplement betaine hydrochloride in tablet form, according to manufacturer's directions. Dr. Sandra Cabot of Liver Doctor explains that although it might not make initial sense to add an acid to your stomach, this is often exactly what you need to relieve your symptoms. The lack of adequate stomach acid, known as achlorhydria, can lead to stomach cancer if left untreated. Adding a natural version of hydrochloric acid in supplement form can help improve absorption of nutrients and aid digestion. Increase your consumption of garlic or add a garlic supplement to your diet, available at your local health food store. 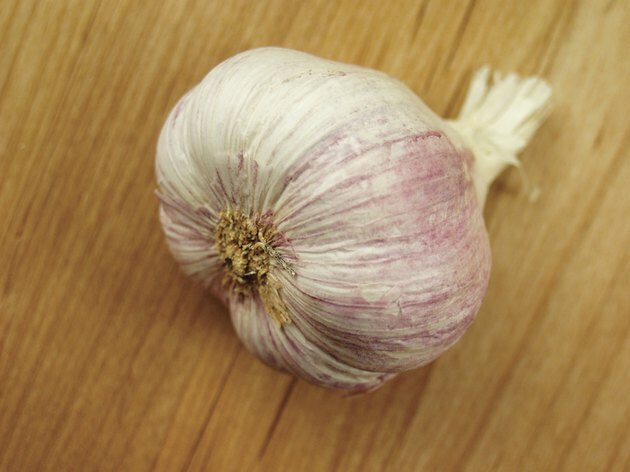 A 2001 article published in the "Journal of Nutrition" explains that the incidence of stomach cancer is lower in populations that consume large amounts of allium, a substance that occurs naturally in garlic, as well as onions and chives, and has been found to have several health-supporting properties. Allium also helps prevent ulcers caused by the Helicobacter pylori bacteria. Sip on a glass of water, while eating, which contains the juice of half a lemon and 2 to 3 tbsp. of a high quality apple cider vinegar. Dr. Sandra Cabot explains that the apple cider vinegar combined with the acidic lemon juice can help supplement the acid in your stomach, helping aid digestion. Additionally, this mixture can help decrease bloating and abdominal gas, which can be caused by impaired digestion. Take a dietary supplement that contains digestive enzymes, available at your local health food store. Chronic indigestion can be a symptom of a lack of adequate digestive enzymes, which can result from too little hydrochloric acid. Taking supplemental digestive enzymes, therefore, can help replenish your stomach's supply of protease, lipase and amylase, the enzymes necessary to digest food. As a result of not having enough of these enzymes, you can experience nutritional deficiencies and symptoms of malabsorption, including allergies. Check with your doctor before making significant changes to your diet or using a dietary supplement. How Do I Settle Acid in the Stomach Naturally?